The gun safe that is right for you will depend on several criteria including whether you need theft prevention, fire resistance, legal compliance, or just simply keeping guns out of your child’s reach. In addition the size you need will vary depending on how many guns you need to store, the length and scopes on any rifles, and if you want to store other valuables besides just guns. The price of gun safes also vary greatly, from about $100 up to well over $10,000, with the largest and safest obviously costing the most. For more info check out our Gun Safe Buying Guide. We looked at numerous models and tried to rank the ones that we felt provided the most value for their price. We could have made a list of the best gun safes regardless of price, but the prices for those units would not be affordable to most people. So instead we focused on units that cost less than $2500, from various sizes and prices below that point. 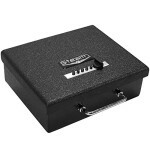 Below you will find our reviews of the best gun safes for the money. We have broken it up into two sections – one for long guns and one for handguns. At the bottom of each section you will find a spec comparison chart to easily compare each gun safe on our list. We chose the $2195 Steelwater AMHD593924-EMP Extreme Duty Gun Safe as the best gun safe. This safe provides superior protection of your valuable firearms from fire and theft and can hold up to a max of 39 long guns, but 24-30 is more realistic. Construction starts with thick 9 ga steel for the body with 4 layers of fireboard. The door is over 5 inches thick with composite construction including a 1/4-inch solid steel plate. When combined with a heat activated expandable door seal it has 2 hours of fire protection at 1875°F. An EMP-proof digital keypad with a drill resistant bypass key provide access. A drill resistant hard plate protects the combination lock, re-locker, gear drive and linkages. It also has an internal spring-loaded re-locking bolt to secure the safe if the lock is punched out. A total of 20 1-1/2 inch diameter steel locking bolts secure the door. In all it exceeds California DOJ regulatory standards for gun safes. Inside you will find automatic LED lighting, fully upholstered grey interior with a two-section gun rack and 4 adjustable or removable shelves for additional storage, and a door organizer. It has been pre-drilled with anchor holes to bolt down. It is the most expensive gun safe on our list, but some models can cost you well over $5000. So, if you want the best security and fire protection for long guns, without spending a fortune, then we highly recommend the Steelwater AMHD593924-EMP Extreme Duty Gun Safe. If you are looking for something cheaper and you still need to store a lot of guns then you might want to consider the $1500 Liberty FatBoy Jr. However, there is an additional $450 freight charge from Gander Outdoors. This 770 pound safe can hold up to 48 rifles (about 30 more realistically) with dimensions of 60.5″ x 42″ x 25″. It has a fire rating of 60 minutes at 1200 degrees F and comes with a Palusol heat-expanding door seal. Security wise it has been awarded UL Residential Security Container burglary classification with a UL listed S&G Group II lock. Overall the Liberty FatBoy Jr. provides protection from fire and burglary with a large capacity all at a reasonable price and we would not hesitate to recommend it to anyone. One of the best gun safes for providing security and fire protection at a decent price is the Liberty 1776 30 Gun Safe which sells for $1400. It has very similar construction compared to the Liberty Fatboy Jr. with the main difference just being the size of 15.2 cubic feet of space compared to 19 for the Fatboy. The 1776 has a manual dial lock, 5 4-inch locking bars, and triple hardened steel plates to protect the lock from drill attack. It is UL RSC approved and provides 60 minutes of fire protection against a 1200 degree F fire. 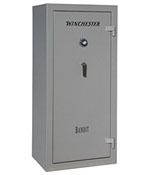 We selected the $958 Winchester Bandit 19 as the best gun safe under $1000. Constructed from 14 ga steel, it is quite a bit lighter than the more expensive gun safes at 372 pounds, while holding up to 24 long guns. With the help of a Pal sol heat expanding door seal, it provide fire protection for 45 minutes at 1400 degrees F. Access to the safe is through the UL listed mechanical dial lock. It also meets CA DOJ Firearm Safety Device requirements. 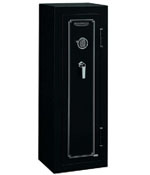 If superior fire and burglar protection is more important to you than size, then you should consider the $719 Steelwater AMEGS592216-BLK Standard Duty 16 Long Gun Safe. Made from 14 ga steel and weighing 330 pounds it has 6.6 cubic feet of interior space which is enough to hold a max of 16 long guns, but about half that is more realistic. Security wise the AMEGS592216-BLK exceeds California DOJ regulatory standards for RSC. It comes with an EMP-proof electronic lock with a bypass key. Door protection includes 10 locking bolts, drill resistant hard plate to protect the lock from being drilled, and an internal spring loaded relocking bolt. Fire wise, it is rated for 60 minutes at 1875 degrees F.
The Steelwater AMEGS592216-BLK is a perfect choice for someone who owns around 8-10 long guns and wants top notch protection. 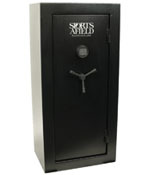 The $600 Sports Afield SA5526BASIC 30 Gun Safe is the best selling gun safe at the Home Depot. The fire rating is less than the more expensive gun safes at just 30 minutes at 1200 degrees F. It also is made from a thinner 16 ga steel, although that does make it lighter and easier to move at 315 pounds. While it says it can hold up to 30 long guns, at 11.5 cubic feet of space, it realistically will hold about half of that. This Sports Afield safe uses an electric keypad to access it with 2 backup access keys. The door has 8 locking bolts and it is CA DOJ approved. It is backed up by a lifetime warranty and a free locksmith if you are ever locked out. Overall the Sports Afield SA5526BASIC is popular because it still provides security from burglary and fire for a large amount of long guns at a very decent price. 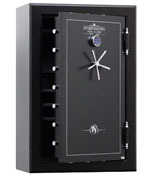 We think the best gun safe under $500 is the Stack-On FS-8-MB-E 8 Gun Electronic Lock Safe which sells for $419. Holding up to 8 long guns, this thing has 4.83 cubic feet of space and weighs 234 pounds. The FS-8-MB-E has a fire rating of 30 minutes at 1400 degrees F. It is listed as a CA DOJ firearm safety device. The door has 5 locking bolts and has an electronic keypad for entry. Overall the Stack-On FS-8-MB-E would make a good choice for someone looking for an affordable, narrow long gun safe that has fire and thief protection. 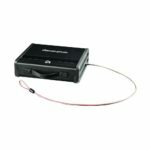 The $237 Barska AX11652 Quick Access Biometric Rifle Safe is one of the best gun safes for less than $300. However, once you get in this price range you will have to forego some important features. In this case there is no fire protection on the AX11652 safe. It is the smallest long gun safe to make our list with just 1.83 cubic feet of space which is enough to hold about 4 long guns. 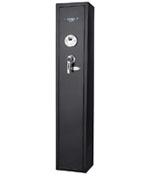 This safe uses a biometric lock or key with the hidden keyhole to access it. The AX11652 is constructed from 2mm thick steel and the door has 3 bolts to secure it. 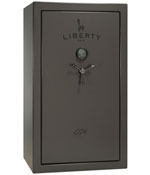 It is by far the lightest gun safe on our list as well at just 62 pounds. Overall the Barska AX11652 is far from the best long gun safe available and has no fire protection. Therefore, you should only buy it if you primarily just need a way to lock up your guns to prevent theft or unwanted access to your guns, like your children for example. If you are looking for a tough, reliable pistol safe then you should check out the Stealth Original Handgun Safe which sells for $300. This unit is made in the USA with a 10 gauge solid steel body and 3/16-inch solid steel wrap around door. It offers a simplex lock which provides up to 1081 unique combinations and encases the lock in a punch resistant housing. Measuring 4.25 x 12.5 x 10.25 inches it is heavier than one would think, but the added handle makes transporting it super easy. Although it is not fire rated, overall we feel the Stealth Original Handgun Safe is the best handgun safe you can buy in this price range. The $257 Fort Knox PB1 Original Handgun Safe is very similar to the Stealth model. It features the same 10 gauge steel body with 3/16″ steel door, gas-strut assisted door opening, and Simplex push button mechanical lock with 1081 combinations. It surpasses the California Department of Justice firearm safety device requirements proving the durability and quality. However, the main difference between the Stealth unit is that it does not have a handle. That may not seem like a big deal, but this thing is heavier than you would expect and that makes the Fort Knox PB1 less portable. If you are going to mount it, and don’t need any portability then go with the Fort Knox PB1. If you need a way to secure mulitiple handguns, then we highly recommend the $549 Vaultek MX Series High Capacity Bluetooth Smart Handgun Safe. With 0.712 cubic feet of space, it can hold up to 8 full-size pistols plus mags. The body is constructed with 14 ga steel, while the door uses 12 ga steel. The truly unique feature of this Vaultek MX Series safe is the 5-way entry access and smart technologies. You can gain access through a Bluetooth app, smart key, upgraded biometric scanner, rapid fire backlit keypad, or manual keys. 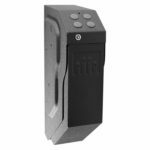 Overall the Vaultek MX Series High Capacity Handgun Safe is the most expensive handgun safe on our list and costs a lot for zero fire protection, but it has the most capacity as well. If the smart features interest you, and you have multiple handguns then this is definitely one to consider. If you are looking for a gun safe with a drawer that slides out when you open it, then the $300 Slide-Away V-Line Pistol Safe is for you. This thing uses a simplex lock and is made in the USA from 12 ga steel. It comes with a pullout drawer with ball bearing sliders that can easily hold two 1911 type firearms with room to spare for extra magazines. The Slide-Away is versatile enough to mount underneath a desktop or in a small area as long as there is about 4.25 inch of clearance. It comes standard with a mounting bracket for both bottom and top mounting. It is perfect for mounting underneath a nightstand as well. 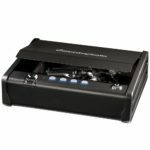 The $239 Vaultek VT10i handgun safe is the smallest in Vaultek’s lineup with just .046 cubic feet of space or interior dimensions of 9.875″ x 5.375″ x 1.5″. That is enough to hold one full size handgun or possibly two sub-compact models. It is constructed of thin 18 ga steel which is a bit on the weak side, but makes for a lightweight portable safe to take with you on the go – in fact it meets TSA airline firearm guidelines. What really stands out is the 4-way access which includes a biometric fingerprint scanner, backlit keypad, bluetooth app, or manual key. If you need just a bit more interior space, the Vaultek VT20 is also available which is a slightly larger model for just $25 more. We chose the $179 SentrySafe QAP1BE is the best handgun safe under $200. It is constructed out of 12 ga steel and has .08 cubic feet of space. The lock is equipped with a biometric fingerprint scanner with a manual keypad and overide key for backup entry. The QAP1BE also features a gas strut to automatically open the door, however some owners have experienced strut failure after 2 to 3 years of use. One of the best hidden gun safes or handgun safes under $100 is the GunVault SV500 which sells for about $92. It has mulitple mounting options and works great to mount under a desk or nightstand. The SV500 uses a keypad for entry with a backup key. When opened the drawer automatically lowers down, leaving your handgun in perfect position to grip fast. The only downside is that it can only hold one handgun, and it won’t hold a revolver or any extra magazines. We think the GunVault SV500 is perfect for a single, hidden, quick-acess safe. However, it won’t provide a lot of defense against burglars so it is best to keep it in a somewhat hidden location. The cheapest handgun safe to make our list is the $70 SentrySafe PP1K Portable Handgun Safe. It uses a simple key lock. This thing is not meant to be a home safe, but instead a portable one you take with you when traveling – maybe to the range to get some practice. It doesn’t have any mounting options, instead it has a 25 inch steel tethering cable and carrying handle. It is TSA approved for U.S. commercial aviation. You should probably only consider buying the SentrySafe PP1K if you need a handgun safe to travel with. Here are some of the most important factors to take into consideration when shopping for a gun safe. Note: Buyers should be aware that no residential safe will prevent theft if criminals have enough time and knowledge. They are designed to buy time or deter thieves without the proper tools or knowledge to reach the contents. Construction and Size – The general toughness of a safe is determined by the thickness of steel it is made from – the thicker the better. Just keep in mind that that the thicker the steel, the more the safe will weigh – which is why comparing the weight of safes can also help determine how well it is made. When considering size, you need to decide if you just need to store handguns or if you will be storing long guns (rifles or shotguns). This will greatly effect the size of the safe you need – also keep in mind that rifles with scopes take up much more space. Most people end up buying a model that is too small, because they don’t consider that in addition to guns they want to store jewelry, documents, ammo, and other valuables that take up a lot of space. Therefore consider getting one that is a size larger than you think you will need. Security Rating – Underwriters Laboratories (UL), a third party rating agency, will rate safes as an RSC (Residential Security Container) which basically means it is built to resist breaking into. Then above that there are other ratings that can be achieved, but the price for those models will be in the many thousands. However, many manufacturers will not pay the fees that UL charges them to rate their products, so not all makers will have this rating. There is also varying levels of security features for models with an RSC rating like pry-resistant doors, continuous welded bodies and doors, numerous hardened locking bolts of at least 1-inch, drill resistant lock plate, and many more. Fire Protection – You will see fire ratings listed normally as a certain amount of time at a maximum temperature like 60 minutes at 1200 degrees. However, there is not a universal standard that all companies use to measure this. Some test internally and some use independent labs so take any specs listed as a general guideline. What you should look for to help with fire resistance is the thickness of the door and body, some form of fire insulation material, and a heat-expanding door seal. Locking Mechanism – The lock itself can also be UL rated as Group 1 or Group 2 combination lock. This is a very important feature for theft deterrent. There are also electronic locks which require the use of a battery that must be replaced periodically and bio-metric locks which can read your fingerprint for access. Other Features – Some other features you might want to consider include mounting holes to bolt the safe to the floor, a built in light or electrical outlet for lights or a dehumidifier (some models come with a hole which just needs to be drilled out to allow an electric cord), the location of the hinges – internal hinges only let you open the door 90 degrees, and a long term warranty.